earMUSIC, the Hamburg based international rock label part of Edel Group, will release "I+III+LV" by Chickenfoot on January 25, 2013. The box set will include the worldwide Top 10 debut album "Chickenfoot" and the successful follow-up, "III", and the limited live release "LV", released in December and limited to 10.000 numbered copies in Europe. "LV" features over an hour of live music made of four unreleased live songs recorded during the "III" world tour and a series of very rare digital bonus tracks and B-sides live. The band's self-titled debut album became one of the biggest rock successes of 2009, going on to sell close to one million copies. The album is included in the box set, for the first time featuring the rare B-side, "Bitten By The Wolf," previously only available on vinyl LP. The follow-up, "III", is featured in the box set in its limited CD+DVD version, featuring a bonus DVD with exclusive behind the scenes content, videos and live music. 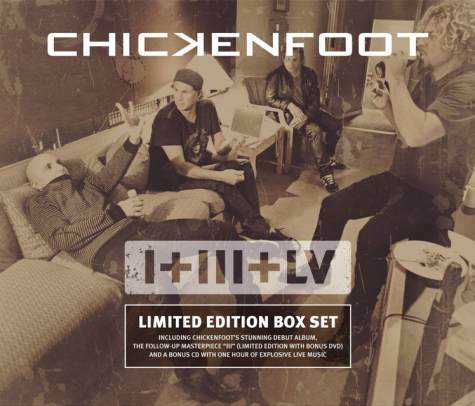 "LV", Chickenfoot's first live CD, includes rare live versions of their biggest hits like "Big Foot", "Oh Yeah" and "My Kinda Girl" and four previously unreleased live songs from the most recent world tour featuring Kenny Aronoff on drums (stepping in for Chad Smith, who was busy recording and touring with the Red Hot Chili Peppers). For all the most dedicated fans who have already bought "Chickenfoot" and "III", Chickenfoot will make the extra disc, "LV", available for a limited period as a stand-alone CD, released all over Europe on December 7, 2012 (strictly limited to 10,000 numbered copies). Sammy Hagar expressed his enthusiasm with his proverbial energy when asked to comment about the limited release of "LV". "Every now and then with great bands some songs just outdo the original recordings live," he said. "À la 'Live At Leeds', 'Frampton Comes Alive' etc. I feel these four live Chickenfoot tracks do just that. Especially 'Something Going Wrong'. If it were 20 years ago when DJs were allowed to play what they wanted to play, this song would be a hit at rock radio. There's magic there, check it out. If the fur doesn't come up on your arms, it wasn't loud enough! Crank it up and enjoy!" Chickenfoot have issued a teaser video clip of “Something Going Wrong” as a preview of the forthcoming package.